CHARLOTTE, N.C. (USA) -- The hardest part of meditation isn't quieting the mind or tolerating sore knees or explaining to your family what the heck you're doing. That's why "Commit to Sit" is such a valuable new manual. It gets to the basics, including the initial problem of commitment, without a lot of intellectual chit-chat. Its contributors are many of the best — and best-known — meditation teachers in the West. The three dozen or so short essays have been compiled from the magazine Tricycle, a quarterly Buddhist review. Although this book has its roots in Buddhist meditation (after all, they are experts), this guidance would be useful to anyone of any religion who wants to explore the fertile territory of silence and contemplation. While its language and metaphors are Buddhist, "Commit to Sit" isn't pushing Buddhist religion. 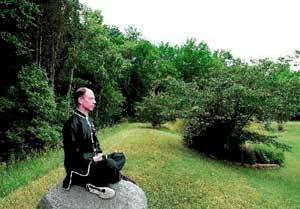 It is teaching the ecumenical fundamentals of meditation practice. The teachers use the term "practice" deliberately. Meditation isn't something you accomplish, like writing a novel. It's something you practice, like playing the piano. It's both a physical and a mental activity, and it is widely misunderstood. "Meditation is not about getting away from it all, numbing out, or stopping thoughts," writes Lama Surya Das in the opening essay, "The Heart of Meditation." "Meditation, simply defined, is a way of being aware. ... Meditation masters teach us how to be precisely present and focused on this one breath, the only breath; this moment, the only moment. Whether we're aware of it or not, we are quite naturally present to this moment, where else could we be? Meditation is simply a way of knowing this." His guided meditation follows — gentle instructions on how to sit comfortably, settle down, use the breath as an anchor to the moment, and then, "Enjoy the buoyant peace, harmony, and delight of natural meditation." Sylvia Boorstein's "Focusing on the Breath," with an intriguing look at what we can see in just five minutes of meditation. Jon Kabat-Zinn writes about coping with chronic pain, and Karen Ready gives tips for those with sore backs in "Pull Up a Chair." "As human beings we have a very low tolerance for discomfort," Pema Chodron writes in the foreword. "But it is precisely at the place where we can't get comfortable that the journey to awakening begins." "Commit to Sit: Tools for Cultivating a Meditation Practice"
Edited by Joan Duncan Oliver.